Nominees for Rising Star of the Year Award are UIC research scholars within ten years of their Ph.D. who have made significant contributions over at least the last three years at the institution. Dr. Yury Polikanov is the 2018 recipient in Basic Life Sciences. During this time, Dr. Polikanov has published twelve influential papers, received an NIH research grant, and contributed to an international research team that has discovered a new class of antibiotics. 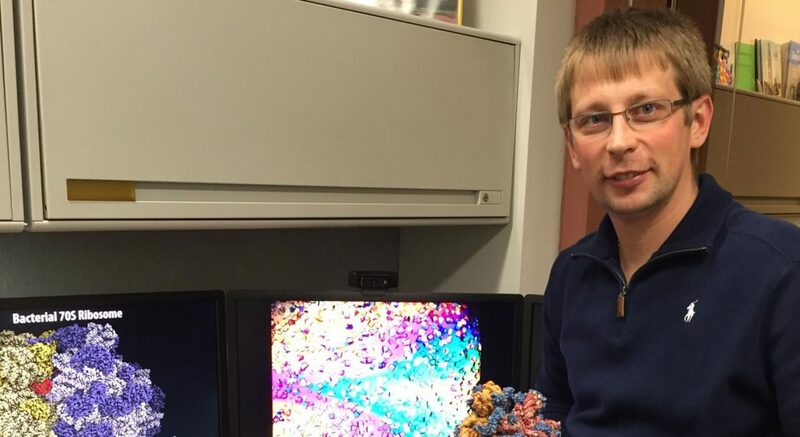 Dr. Polikanov is recognized for advancing knowledge on the structure and function of the ribosome, the molecular machine that has vast implications for the future of global health and antibiotic drug development. Ribosomes translate genetic code into proteins that control nearly all cellular processes. In the bacterial cell, the ribosome is a major target for antibiotic drugs, and ribosome inhibitors constitute over half of all approved drugs used to treat bacterial infections in clinic. Dr. Polikanov’s Lab uses X-ray crystallography technique to determine nearly atomic resolution structures of various antibiotics bound to target ribosomes. This technique allows for insights into how these antibiotics work, and how they could be improved. The major problem with the currently available antibiotics is the rapid development and spread of resistance to them among pathogenic bacteria, which quickly renders them less effective. The World Health Organization calls antibiotic resistance one of the biggest threats to global health, food security, and development today. Widely known for his collaborative style, Dr. Polikanov, together with colleagues from the College of Pharmacy at UIC and the French biotech company Nosopharm, recently discovered a new class of antibiotic drugs – odilorhabdins (ODLs). Members of this class of antibiotics may be effective in treating resistant bacteria, such as the “superbug” Carbapenem-resistant Enterobacteriacea, that are no longer as responsive to antibiotic drugs of last resort. Dr. Polikanov said that, “Like many clinically useful antibiotics, ODLs work by targeting the ribosome, but ODLs are unique because they bind to a place on the ribosome that has never been used by other known antibiotic drugs.” Most antibiotic drugs slow the growth of pathogenic bacteria, but ODLs actually kill the bacterial cell by causing the ribosome to misread genetic code and thereby create flawed proteins. Recently, the researchers tested their drug against bacteria, including Carbapenem-resistant Enterobacteriacea, with optimistic results. In addition to his collaborative endeavors, Dr. Polikanov is an educator and mentor. His research into the ribosome is becoming “textbook knowledge,” says Alexander Makin, colleague and professor in the Department of Medicinal Chemistry and Pharmacognosy. “He challenges you,” says Zahra Batool, a second year student in the MCDB research area of the Biological Sciences and member of Polikanov Lab. Dr. Polikanov is quick to give credit to his graduate students, and is himself a credit to the core educational mission of function of the University of Illinois. An awards ceremony and reception will be held on February 6, 2019, from 3:30 p.m. to 6:00 p.m. in the Michele M. Thompson Rooms of the UIC Student Center West at 828 South Wolcott Avenue. Read Dr. Polikanov’s full profile.